Muli Ke Parathe is a symbol of childhood memory of mother. 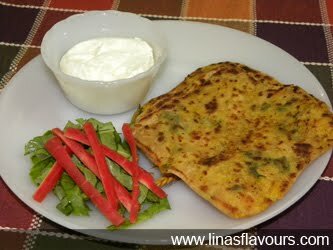 Obvious, the Muli (Radish) in Paratha with taste and flavour- combination of chilly, turmeric, cumin-coriander and fresh coriander gives homely feeling. You can have it with variety of dips in breakfast or as Main Course. Grate the radish. Squeeze it with your hands and drain out all the water. See that the water is drained properly otherwise it will be very difficult to roll the parathas. Do not throw away the radish water. You can use for kneading the dough. Take a bowl. Add radish, salt, red chilly powder, turmeric powder, cumin-coriander powder, coriander leaves and mix it well. Take flour, add salt, oil, radish water and knead dough. Add water as needed. Make small 10-12 balls. Take one ball. Roll it about 3-4 inch diameter paratha. Put about 1-1 ½ teaspoon of radish mix in the centre. Roll it from all the sides and cover it. Use some flour and roll the paratha into 5-6 inch diameter paratha. Take non-stick tawa and cook it on both the sides smearing with oil. Prepare all the parathas in same way. Serve it hot with curd, cucumber raita or pickle.